Cannon Ball, ND — Longtime activist and award-winning actress Jane Fonda — a sharp critic of the government’s failure to honor treaties with Native American First Nations — will join a delegation of 50 people serving a feast to Standing Rock Sioux and other water protectors at the Oceti Sakowin camp on Thanksgiving Day. Amid increasing awareness of genocide and centuries of exploitation and oppression perpetrated against Native Americans by the U.S. government, a feast slated for the problematic annual holiday could easily but needlessly be misconstrued. Indigenous rights and local food advocate, Judy Wicks — former owner of Philadelphia’s White Dog Cafe, which annually serves a traditional Native American dinner on Thanksgiving for Native Americans — wanted to do the same for water protectors opposing the Dakota Access Pipeline. “We would recognize them and thank them for the many foods in our contemporary diet that they originally cultivated,” Wicks explained to Civil Eats, a news daily focusing on sustainable agriculture as an economic and social solution, of those annual celebrations. Wicks, who lived in an Alaskan Eskimo community in 1969, wanted to ensure such a feast would be welcome and appropriate from an Indigenous standpoint, so she consulted with friend, Director of the Indigenous Environmental Network, Bob Goldtooth, for his opinion. “He said, ‘absolutely,’” Wicks told Civil Eats of their conversation. “He told me most of his friends at Standing Rock celebrated the American holiday,” she said, adding Goldtooth felt anything drawing more attention to effort of thousands opposing Dakota Access would be appreciated. “Our purpose is to give back to Native Americans – the Standing Rock Sioux and representatives of over 300 native tribes from throughout the Americas who have joined them in support,” Wicks told Native News Online. Immediately she summoned a group of activists, chefs, and volunteers to join her in North Dakota next weekend, where the group also plans to lend a hand in the construction of a straw-bale community center, called Makagi Oti, and planned by tribal leaders. “The Magaki-Oti or Brown Earth Lodge is being designed as a place for Protectors who need shelter during the coming winter months with gusty winds and temperatures in the minus 20s or lower,” Bob Gough, Secretary of the Intertribal Council on Utility Policy, stated in a press release. Called a Wopila Feast — the Lakota term for a broad statement of thanks — Wicks, Fonda, and the group will serve locally-sourced, traditional fare to some 500 water protectors at the Oceti Sakowin camp. 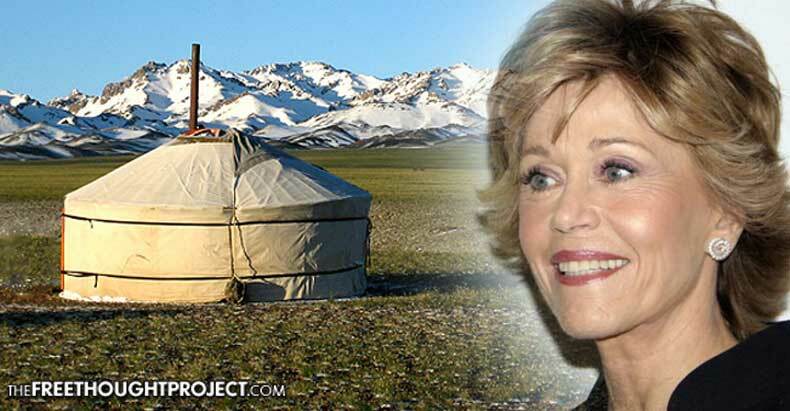 Fonda, in addition to joining the group, plans to donate four much-needed Mongolian yurts and five butchered bison. Yurts — round, semi-permanent tents reinforced with framing and usually equipped with a heat source doubling as a stove in the center — are traditional housing used by nomadic cultures for centuries as defense against the elements for their ease of portability. Water protectors, dedicated to remaining in several encampments near Cannon Ball, North Dakota, close to the banks of the Missouri River, face a potential humanitarian crisis with a winter predicted to be even harsher than usual. With a centralized heat source, and ranging in size from that of a large ordinary tent to over 300 square feet, these yurts could provide life-saving protection from the elements — particularly the notoriously strong winds of the northern plains. Camps have already experienced frosty temperatures, but daytime highs in Fahrenheit are not expected to escape the teens many days in January, with wind chills dropping far into negative digits — so the yurts, construction of the community center, and the responsibly-sourced outdoor banquet will be most welcome ahead of frigid conditions. With Energy Transfer Partners — the conglomerate of companies responsible for constructing the pipeline — planning to forge ahead with the project if and when the Army Corps of Engineers grants the necessary easement, water protectors feel camping to block Dakota Access is an absolute obligation. Volunteers planning the feast see it as a prime opportunity to call attention to the cause, especially amid a veritable blackout — or, worse, mischaracterization — by mainstream, corporate press. “I’m very excited about being of service in this exact way at this exact time,” Jeremy Stanton, owner of a sustainable butcher shop and fire-roasted catering business in Massachusetts, who will bring his core staff to assist with the feast, told Civil Eats. Wopila Feast volunteers plan to serve dishes with traditional ingredients, including squash, sweet potatoes, wild rice, ground corn, and cranberries, among other items. Evincing activism’s myriad forms, Stanton’s food expertise offers him a chance to help in the way he knows best — providing nourishment for the water protectors. “This is about being an activist in the way that I know how to be an activist—by feeding people,” he told Civil Eats. For her part, Jane Fonda has already participated in an arts education program at Solen Middle School in the Standing Rock Sioux Reservation earlier this year. Indeed, the activist and actress is no stranger to the American Indigenous rights movement — in 1969, she supported the Native American occupation of Alcatraz Island, intended to garner attention to continued treaty rights violations and the need for Indigenous sovereignty. For Fonda, Wicks, and the others involved in serving the Wopila Feast, volunteering was never a question.